avada wrote: Why can't FEBE create the backup folder to save backups into? It seems like silly limitation. It's quite a nuisance, making sure that the folder exists. A couple of years ago, some Russians hacked my forum and I had to move it. There may be some pages that still link to the old url. Do you remember how you were trying to get to the forum (what page was linking to it)? As far as FEBE creating the backup destination directory, that is something that usually doesn't have to be done very often. 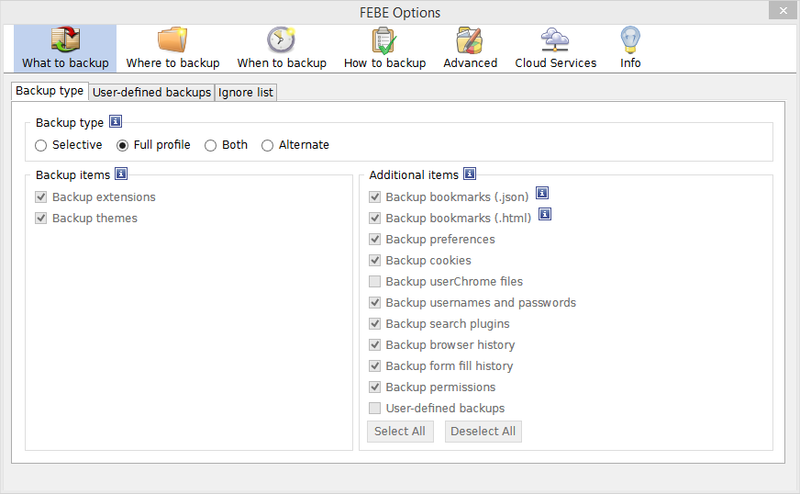 There is a 'browse' button next to the FEBE Options > Where to backup > Backup destination directory that allows you to navigate to any folder using an explorer type window. That window has a 'New folder' button that will create a directory anywhere you want. ETA: I remember now that there was a FEBE user located in Iran that could not access the forum some time back. That's why I created this thread. Apparently you need to be in North-America for it to work. Shadoefax wrote: ETA: I remember now that there was a FEBE user located in Iran that could not access the forum some time back. That's why I created this thread. Yes, we talked about this. It also didn't work for me a few months ago when I first posted here. And it still doesn't. Shadoefax wrote: As far as FEBE creating the backup destination directory, that is something that usually doesn't have to be done very often. There is a 'browse' button next to the FEBE Options > Where to backup > Backup destination directory that allows you to navigate to any folder using an explorer type window. That window has a 'New folder' button that will create a directory anywhere you want. It would still be more reliable to create the path if it doesn't exist, FEBE also allows me to save a path even if it doesn't exist and it can't save to it without even a warning (by copy/pasting or just typing manually), setting up a failure. Which I immediately ran into. It was most convenient to me to just paste a path for my backups and type in a subfolder for febe. When activates it hangs the browser for minutes which is not nice. Can't it be done asynchronously? But even worse is that partway through the backup process is halted because of firefox's usual a script is running but not responding message, which I have to click, for it to continue. Can't this be dealt with? When activates it hangs the browser for minutes which is not nice. Are you talking about the backup itself or opening the options window? I have no control how fast the options window opens. Every Fx release seems to make it open slower and slower. Can't it be done asynchronously? The backup can. In fact the FEBE Options > How to backup > Run asynchronously option is checked by default. Yes. Try adjusting the setting in FEBE Options > Advanced > Miscellaneous > Chrome script timeout (seconds). If you set it to zero, it will never timeout. FEBE only temporarily changes this preference. It is set back to its previous value after the backup is done. I was wondering, why is it impossible to set what is backed up when I do a manual backup? Why do I have to bork the settings to if I want to back up something else (for eg: extensions only), and then re-set it to what it was before? The official forum is still broken and inaccessible from my location. The connection always times out. Of course pinging always results in 100% loss. 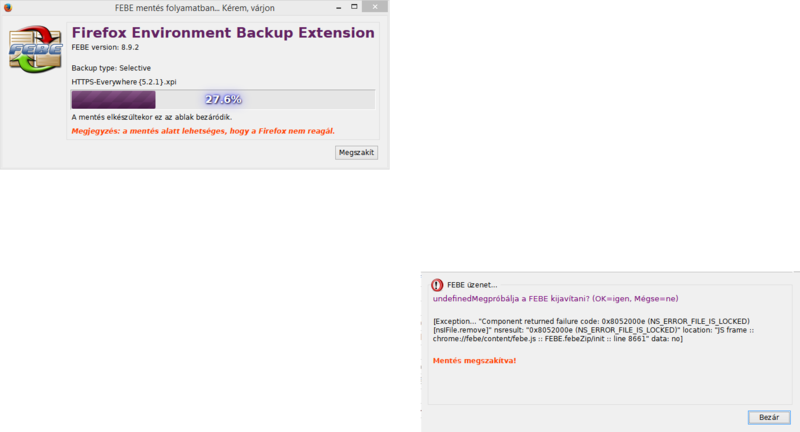 If I select the backup window, another error gets overlaid. Last edited by LIMPET235 on September 8th, 2016, 9:33 am, edited 1 time in total. You can use Tools > FEBE > Quick backup to select only those extensions you would like to backup during a manual backup. Others have mentioned that my support forum is not accessible from some locations out of the United States. I have no idea why, hence this alternate forum. FEBE failed to back up my addons. It fails on the addon HTTPS everywhere. HTTPS everywhere is apparently one of those addons that locks some of its files. FEBE cannot backup locked files. The only recourse (short of uninstalling the extension) would be to add it to the FEBE ignore list (FEBE Options > What to backup > Ignore list). That may be a problem with the German localization. I'll look into it. Shadoefax wrote: You can use Tools > FEBE > Quick backup to select only those extensions you would like to backup during a manual backup. I didn't see that. It's a tad anemic. Lacks even the auto-named folder for the backup, which one expects. So it puts the extensions in the base backup folder by default, which is bad. It could provide one much like scheduled backups such ash "FEBE quick backup...". But even then I I would call it extension backups because that's only what's available. Shadoefax wrote: Others have mentioned that my support forum is not accessible from some locations out of the United States. I have no idea why, hence this alternate forum. Yeah, but did you try and find out why, and fix it? Shadoefax wrote: HTTPS everywhere is apparently one of those addons that locks some of its files. FEBE cannot backup locked files. The only recourse (short of uninstalling the extension) would be to add it to the FEBE ignore list (FEBE Options > What to backup > Ignore list). It seems like the issue was that I had two instances (one disabled) of the same version of the same addon. I think one came from their website directly, the other from AMO. After I removed the one that was disabled the issue disappeared. Shadoefax wrote: That may be a problem with the German localization. I'll look into it. I think if any it would would be the Hungarian localization, because that's what I'm using. PS: The way FEBE names the folder isn't actually standard. It lacks the hyphen between the year and month for ISO8601. Due to Mozilla's decision to deprecate XUL, XPCOM, and XBL, I will no longer be releasing major updates to any of my extensions (at least for Firefox). Any updates will focus on Pale Moon and other Fx forks that still support those APIs. Consequently, we have decided to deprecate add-ons that depend on XUL, XPCOM, and XBL. We don’t have a specific timeline for deprecation, but most likely it will take place within 12 to 18 months from now. We are announcing the change now so that developers can prepare and offer feedback. Add-ons that are built using the new WebExtension API will continue to work. We will also continue supporting SDK add-ons as long as they don’t use require(‘chrome’) or some of the low-level APIs that provide access to XUL elements. FEBE (along with most of my other extensions) cannot be written using the WebExtensions API. Mozilla made the announcement one year ago this month and (if they keep the stated timeline) will start the deprecation between now and the next six months. I'm a huge tab-hog, and I always have about 100+ open at all times, at any given moment. My hard drive started failing (because of age), and I didn't think of bookmarking everything so I just saved a FEBE backup of the profile. After I restored my HDD, and installed FEBE, and restored my backup, I found that pretty much all my tabs are inaccessible! They're just clumped up as one title-less tab. Everything seems to function as they were (extensions, scripts, etc.) at least. Is there a way for me to access the tabs individually through the .fbu file somehow? Or maybe even the places.sqlite file? And yes, the Firefox version is the same. I posted this same paragraph in the form of a review, but I've since marked it for removal. The normal session storage file is sessionstore.js, but if you have the TabMixPlus extension installed, I believe it is session.rdf. I would perform a backup before you restore anything just to be safe. Will do. This is a fresh restore anyway, so I have nothing to backup really. Going to update the post as soon as I try it. EDIT: Rip tabs. Didn't work. It only replicates whatever was left previously in the browser tabls. Managed to fix my problem, and I think this warrants a double post. I don't know if edits actually bump, so that's why I'm making another post. Basically what the solution did was recover all the URLs from the previous tabs. And used it to open the recovery.bak file, in the sessionstore-backups folder. That's basically where all the most recent tabs are stored, as of the latest Firefox framework/standard (48.0.2). Glad you got it squared away. Thanks for posting the solution, it may help others that have the same issue.